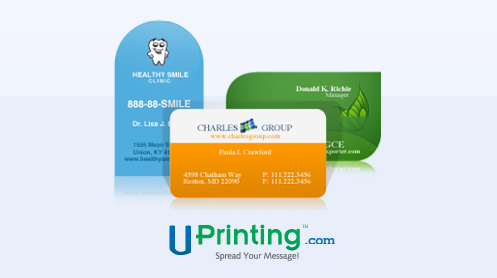 Today,we are happy to announce a giveaway from UPrinting.This time they are offering two (2) sets of premium cool business cards to Designbeep readers. UPrinting.com, a leading socially responsible online printing services, marketing and technology firm, has established itself as a major player in the industry with its distinct vision and clear approach to helping small businesses grow. It serves thousands of on-demand printing orders online daily, using high-quality printing presses and a robust yet simple and easy-to-use online ordering system, resulting in high-end printing at low costs. Just leave a comment to this post.That’s all !! Would love to have unique and awesome business cards from u! This is value addition kind of stuff. count me in for this. I would love to get 250 Die Cut Business Cards. I really need them!. Pleeeease! Have a good day Designers! it would be awesome to have some made!! This would be some prize!!! Hope I win!!! This is fabulously awesome. Uniqueness excites me. Rock ON! I love this site! Awesome giveaway! Good luck all – Cheers! I’m rebranding my photography business right now! This would be perfect! I’m a graphic design student and would love to be able to show off a great looking business card that looks professional and snazzy. Sweet deal! I would love new cards! I am a designer and would love the chance to make a back and front die cut business card. Is selective gloss on a matte background in the mix? wow , but i don’t have any chance ! I could use some new business cards for my revamped portfolio! It’s always great to have some new business cards. Thanks for a lovely contest. I need some cards for my photography. Business cards would be awesome! I just ran out.